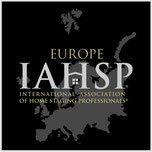 What is Home Staging ? 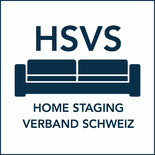 - hsvs1s Webseite! Home Staging is the professional furnishing of a property as an active marketing measure. "There is no second chance for a first impression." 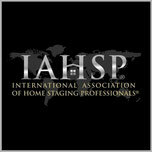 This statement is the foundation of our work as professional Home Stagers of the HSAS. When selling or renting a property, it is important to create a lasting, positive impression for the buyer/tenant. It is well known that only about 20% of all people can imagine a room with another design than the present one and that they find it difficult to grasp the dimensions of a room if it is empty. Potential buyers or tenants are also put off by too many personal objects displayed by a seller. Of course they don't want to buy/rent the home of the previous owner/tenant but rather find a property in which they can imagine their own future. Dark rooms, unkempt gardens or unattractive hallways are often reasons for the stagnation of the sales or rental procedures. The Home Stagers of the HSAS lend properties an ambiance (according to strict rules) in which the majority of buyers/tenants feel comfortable. This increases the demand for the property considerably. 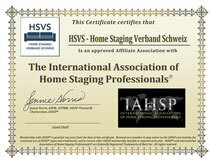 The Home Staging Association Switzerland (HSAS) is a symbol for highest quality Home Staging and a competence on which our customers as well as our members can rely at all times. The duties and goals of the HSAS are to promote the profession to the real estate industry, media, customers and other associations through publicity and communication. The image of our profession is strengthened through members' certification and the code of conduct.